The ability of businesses to survive and thrive often requires unconventional thinking and calculated risk taking. The key is to make the right decisions—even under the most risky, uncertain, and turbulent conditions. 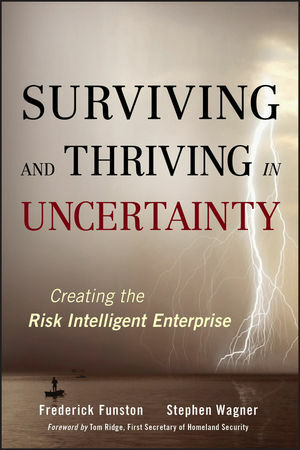 In the new book, Surviving and Thriving in Uncertainty: Creating the Risk Intelligent Enterprise, authors Rick Funston and Steve Wagner suggest that effective risk taking is needed in order to innovate, stay competitive, and drive value creation. Anticipating potential causes of failure can improve chances of survival and success through improved preparedness. Factoring in velocity and momentum can improve speed of response and recovery. Verifying sources and the reliability of information can improve insights for decision making and thus decision quality. Taking a longer-term perspective can aid in identifying the potential unintended consequences of short-term decisions. Frederick Funston is a principal with Deloitte & Touche LLP and has more than thirty years of experience working with leaders of numerous global companies. In 2000, Rick created the concept of risk intelligence for value creation and value protection. He is a frequent speaker and writer on leveraging risk intelligence for competitive advantage in complex, global organizations. Stephen Wagner is a nationally recognized thought leader on corporate governance. In 2009, Steve retired as the managing partner of Deloitte LLP's Center for Corporate Governance, where he led the firm's integrated strategy for governance services. He is a frequent speaker at governance conferences and directors' colleges and has authored or contributed to numerous articles on governance and risk. The Approach of This Book. PART I WHEN RISKS BECOME BRUTAL REALITIES. CHAPTER 1 To Survive and Thrive: A Matter of Judgment. The Revolving Door to the Corner Office. The Imperatives of the Enterprise. CHAPTER 2 Conventional Risk Management Has Failed. The Evolution of Finance, Market, and Risk Management Theory. CHAPTER 3 An Unconventional Approach to Risk Management. Calculated Risk Taking Creates Value. Calculated Risk Taking and Risk Aversion. Risk Intelligence: An Unconventional Approach. PART II TEN ESSENTIAL RISK INTELLIGENCE SKILLS. CHAPTER 4 Check Your Assumptions at the Door. Fatal Flaw #1: Failing to Challenge Your Assumptions. Risk Intelligence Skill #1: Check Your Assumptions at the Door. CHAPTER 5 Maintain Constant Vigilance. Fatal Flaw #2: Lack of Vigilance. Risk Intelligence Skill #2: Maintain Constant Vigilance. CHAPTER 6 Factor in Velocity and Momentum. Fatal Flaw # 3: Failure to Consider Velocity and Momentum. Risk Intelligence Skill #3: Factor in Velocity and Momentum. CHAPTER 7 Manage the Key Connections. Fatal Flaw #4: Failure to Make Key Connections and Manage Complexity. Risk Intelligence Skill #4: Manage Your Key Connections. CHAPTER 8 Anticipate Causes of Failure. Fatal Flaw #5: Failure to Anticipate Failure. Risk Intelligence Skill #5: Anticipate Causes of Failure. CHAPTER 9 Verify Sources and Corroborate Information. Fatal Flaw #6: Failure to Verify Sources and Corroborate Information. Risk Intelligence Skill # 6: Verify Sources and Corroborate Information. CHAPTER 10 Maintain a Margin of Safety. Fatal Flaw #7: Failing to Maintain a Margin of Safety. Risk Intelligence Skill #7: Maintain a Margin of Safety. CHAPTER 11 Set Your Enterprise Time Horizons. Risk Intelligence Skill #8: Set Your Enterprise Time Horizons. CHAPTER 12 Take Enough of the Right Risks. Fatal Flaw #9: Failure to Take Enough of the Right Risks. Risk Intelligence Skill #9: Taking Enough of the Right Risks. CHAPTER 13 Sustain Operational Discipline. Case Example: The U.S. Submarine Force. Fatal Flaw #10: Lack of Operational Discipline. Risk Intelligence Skill #10: Develop and Sustain Operational Discipline. PART III CREATING THE RISK INTELLIGENT ENTERPRISE. CHAPTER 14 Risk Intelligence Is Free. A Closer Look at Costs. The Rewards of Risk Intelligence. CHAPTER 15 Risk Intelligent Governance. Committees of the Board and Risk Intelligence. Where Does Risk Oversight End and Risk Management Begin?. CHAPTER 16 Risk Intelligent Enterprise Management. Developing Risk Intelligent Enterprise Management. CHAPTER 17 The Way Forward: Creating the Risk Intelligent Enterprise. The Benefits of Improved Risk Intelligence. What’s Your Enterprise Risk IQ?